The greatest land campaign of World War II began on 22 June 1941 when Adolf Hitler ordered German armies eastward against the Soviet Union. Confident that Operation Barbarossa would result in a rapid offensive victory over the Russians, the Germans were unprepared for the prolonged, savage conflict that followed. Germany's unpreparedness showed in a variety of ways. Strategic planning was haphazard, logistical support was insufficient, and given the magnitude of both the theater and the enemy, the number of committed German divisions was wholly inadequate. 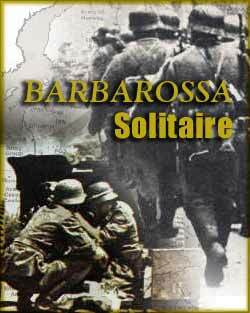 A solitaire game simulating the struggle between Nazi Germany and the Soviet Union on the Eastern Front 1941-45. The player takes control of the Nazi forces against a simulated Soviet opponent. Over time, the players forces gradually weaken and Soviet attacks increase - can you do better than history? Christopher Peters 8 8 8 Simple, to the point and a nice little diversion for what it is! Ralph Moritz 8 2 5 Enjoyable game at a good price. Be sure to download the user-contributed map & counters from BGG - the included ones are terrible. Jeremy Ward 8 7 8 Solid rules and an interesting game. Plenty to play with, willl make my own map and counters in due course. Dan Stormont 10 5 8 Well-designed solitaire game - very hard to beat. Poor graphics, though. Ken Filewood 7 5 4 Good value for the low price. The rules are comprehensible, and some work has gone into the map and campaign timeline. The game is hampered by the lack of intelligence in the automated (random) Soviet player, which makes each turn a gamble. thomas ryan 9 5 5 Fun, quick game of the Eastern Front. Has a high replayability, can be a challenge. Worth the money! Paul Healey 4 3 4 interesting overview game but map needs more attention, turn track and CRT chart would help. JOSE DINIZ 10 7 7 good solitarie game. ray smith 2 3 3 Too simple a game. Rules work but staying with Russian Campaign. tim densham 8 7 8 Very happy with the game. 1 hour to fight the eastern front, who would have thought? Steve Matsumoto 9 8 9 Play in this army-level simulation is quick, smooth, and fun thanks to clever rules and good balance. Terence Turnovsky 7 7 7 Good basiic game, but, not quite as replayable as his other designs due to simplistic AI. Elias Nordling 5 4 4 A bit too simple for my tastes. Bjorn Soderlund 8 4 9 Really fun cofee-break game. played a handfull of games already.